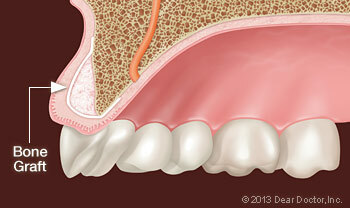 Saving Teeth — When severe periodontal disease causes bone loss, teeth can become loose and at risk of being lost. In order to save them, Guided Tissue Regeneration (GTR) attempts to regenerate lost periodontal structures, such as bone, ligaments, and connective tissue attachments that support the teeth. This increases the bone support and helps keep the teeth in place. Dental Implants — In this optimal tooth-replacement system, a small titanium post embedded in the jawbone is attached to a highly realistic dental crown, permanently replacing the missing tooth. Implants require good bone volume and density to achieve their excellent functionality and high success rates. 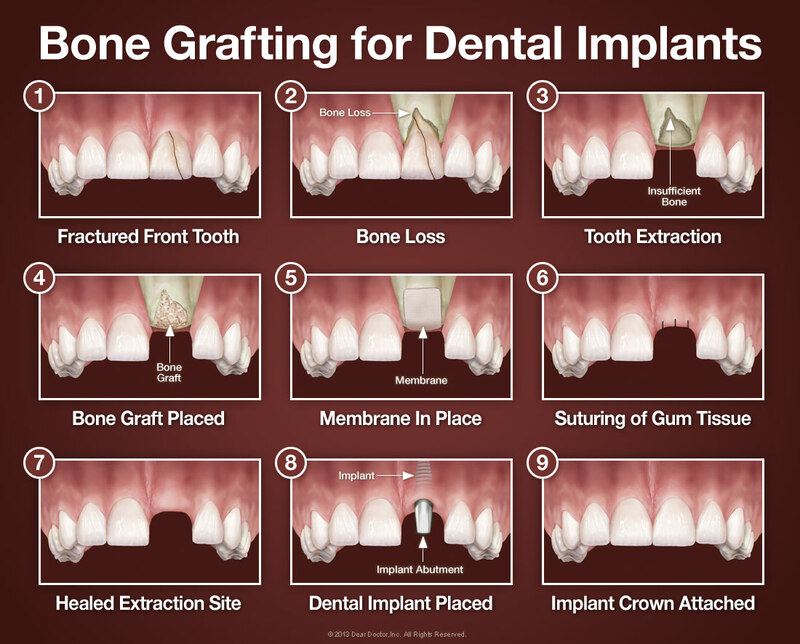 If you have already experienced bone loss, a graft can help regenerate enough bone to place the implant successfully.If a tooth is lost, a patient may seek dental implants to restore his/her smile. However, even dental implants need a healthy jawbone before they can be placed. Ridge Augmentation or Guided Bone Regeneration (GBR) is a bone graft procedure that restores the bone before the placement of implants by increasing the width of your jawbone or by filling in an extraction socket to prevent loss of bone during healing. Biocompatible membranes and bone grafts keep the tissue out, thus allowing the bone to grow. For the first 4-5 hours after the surgery, we recommend placing an ice bag to your face in 20-minute intervals. This will help reduce facial swelling. If needed, you can use an ice bag for 24-hours. Your face will likely swell after surgery, so this is no cause for alarm. The ice and NSAID medication will both help alleviate the facial swelling. If you had surgery on your sinus, we ask that you please take an antihistamine as directed on the box for the first 4-5 days, especially if you are prone to feeling “stuffy” or sneezing. Be careful, due to the fact that an antihistamine can make you sleepy. Please take your prescribed antibiotic as directed. We ask that you finish the entire dosage. If you notice that your pain or swelling are only increasing, or that you have a fever, please call our office immediately. We will be able to tell you if you have an infection. Some minor oozing is expected for a few days after surgery and is no cause for alarm. If you see a lot of “red” in your mouth, it is likely a mixture of a little blood with your saliva. Blood can strongly “dye” and will tint your saliva red. You are likely not bleeding nearly as much as it seems. To stop the bleeding, apply pressure on the surgical site with a moistened piece of gauze or a tea bag for 20 minutes. If your bleeding is moderate to heavy and has continued for a few hours without stopping, please call our office immediately. Sometimes patients have nosebleeds after sinus augmentation surgery. If this happens, lie down with your head elevated and place an ice bag to your nasal area. If your nosebleed continues longer than 30 minutes and will not stop, please call our office immediately. We ask that you do not try to eat until all the anesthesia has completely worn off. For the first week after surgery, we suggest eating high protein foods and liquids. You may eat very soft foods if this can be done easily. Because your mouth will be sensitive, the food that you eat during the first week should be soft. Please DO NOT eat anything that is spicy, salty, acidic, very hot or very cold and please do not eat anything hard or crunchy, such as nuts, popcorn, chips, etc. We strongly request that you continue your regular oral hygiene habits on all other areas of your mouth. Please do not brush or floss the the surgical area during the first week after surgery as this will hinder the healing process. For the next month, please DO NOT use an irrigation tool, such as a WaterPik. You can use an antiseptic mouthwash at least once in the morning and once at night before bed until your next appointment with our office. You can also gently swab the exposed surgical area with a cotton swab dipped in antiseptic mouthwash every morning, every night before bed and after eating and drinking. If you have a removable appliance that replaces missing teeth and it touches your surgical area, please refrain from using this appliance as much as possible. We do not want any unneeded pressure on the surgical area as this could cause pain and hinder healing.